The idea for this dish came to me while I was watching the final episode of Gordon Ramsay's Best Restaurant (on Netflix), where one of the finalists, Casamia, had on their winning menu "risotto" made with potatoes. I loved the idea as much as I love potatoes and I decided to make it for dinner tonight. I baked this eggplants, then topped it with my version of potato "risotto", Pecorino cheese, and broiled it for 5 minutes. We loved every bit of it, no leftovers tonight. What was your treat to yourself tonight? Thanks Inessa. 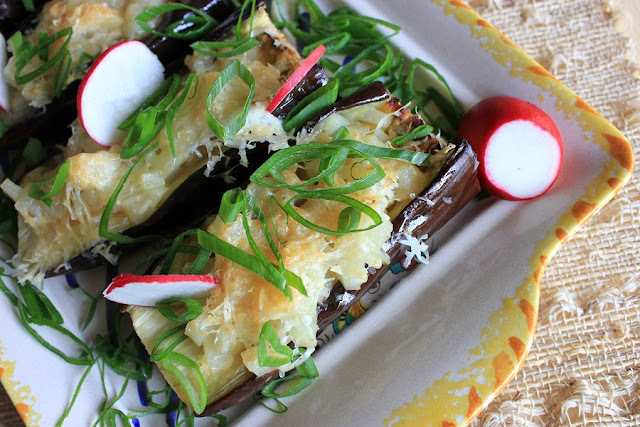 We love eggplant and eat it a lot in many different ways. Wow, it looks so delicious!!!Yummmi! thanks Danutza. 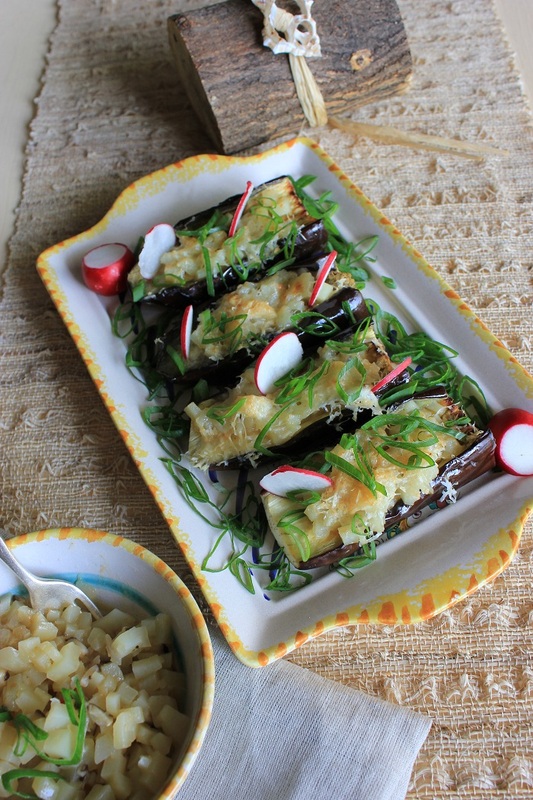 I am sure you have some great recipes with eggplants too! That does look very inviting. Love the presentation. I love eggplant! My hubby does not share the same feelings. It looks amazing! Wow! It's a huge compliment Lorraine! Oh yum - love eggplants so this is calling my name. Making the potato "risotto" with red or blue potato should be fun and colorful. Yes Norma, it would be beautiful and delicious! I am all nerves during the tax season. I do it as soon as we have all forms in, in February usually. Good luck! That looks delicious, potato risotto sounds interesting. Thanks LiZ! I was intrigued myself as I love potatoes and wanted to try what it would taste like. And it was lovely!